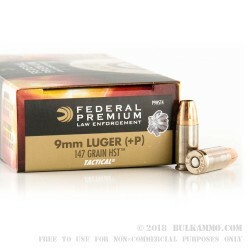 This 9mm +P cartridge from Federal Premium’s Law Enforcement line of ammunition features a 147 grain HST jacketed hollow point projectile. 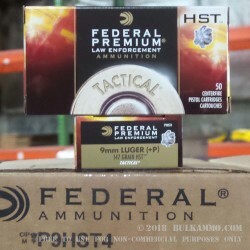 Federal developed the HST to meet the performance requirements of police departments and government agencies looking for a bullet that would expand to a larger diameter -- without sacrificing penetration. This Federal accomplished by adding a cannelure in the bullet’s shank to hold its core and jacket together, as well as external skives to the jacket itself. 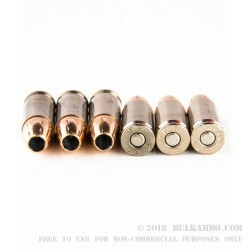 The result is a bullet that retains nearly 100 percent of its weight even as it passes through tough barriers, and still mushrooms reliably. 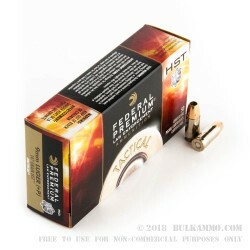 HST initially wasn’t offered to the civilian market upon its introduction in 2002, but now you can chamber it in your pistol for one of the most effective approaches to personal protection out there. This round also features a reloadable brass casing, which is nickel plated to facilitate in feeding and ejection. 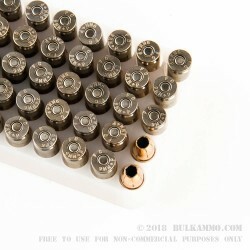 Please note that this is +P ammunition, so you must only load it in weapons that can handle its tremendous power. Q: What is the muzzle velocity and energy? A: Hello Mike! I appreciate you taking the time to reach out to us about those ballistics. According to Federal, the muzzle velocity of this round is 1050 fps with a muzzle energy of 360 ft. lbs.